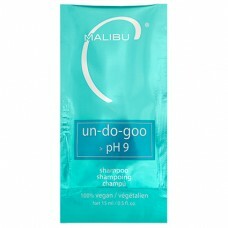 Undo product build-up and resins in your hair with Malibu C Un Do Goo Shampoo. In handy 15ml sachet size, great for travel, on-the-go or simply an introduction to the product before considering the full size, this 100% vegan treatment is the innovative alternative to traditional clarifying shampoos. Incredibly effective yet much gentler than traditional clarifying shampoos, Malibu C Un Do Goo Shampoo is a cleanser infused with soothing botanicals to immediately remove product build-up and restore hair to softness, shine and manageability. Vital moisture is retained. Experience the delightful scent of orange and vanilla bean for a sublimely sweet cleanse. Suitable for weekly use on all hair types. Massage thoroughly into wet hair then rinse. Follow with Malibu C treatment of your choice.